It's been a gorgeous Autumn, and I have more snapshots to share than anyone would have the patience for - but I thought these colour-grabs, from an afternoon adventure to Sizergh Castle in the Lake District, might give a little insight into the simple things I find inspiration in. 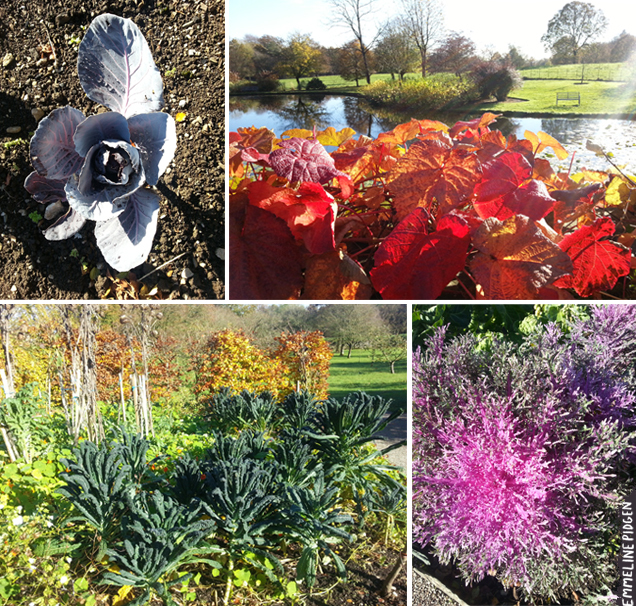 Most of these are from a small vegetable garden in the castle grounds, overwhelmingly bursting with colour. It's great to take inspiration from nature, and these small capsules of fine leafy curls and dusty textures will probably make their way into my work at some point. So make sure your harddrives aren't completely full of selfies, and take the time to snap anything you think might inspire you in the future. It's so great to have a collection of forgotten moments and objects that can spark ideas years down the line! Oh I've been to Sizergh Castle too! I liked the gardens / the apple trees :) I'd forgotten about that place. Thanks very much Laura! Yes Sizergh is gorgeous, I love exploring the Lake District - so many little gems!